Moosey's Country Garden blog to make sure it was actually in season there at the moment. 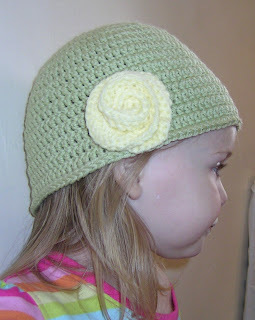 Actually I would have liked to do this in peach but I'm completely broke and can't afford any more yarn at the moment. Hey ho - it looks good in yellow too! I finished another "thing to put away" last night which I can't show any pics of yet - it is a bit frustrating making gifts and not being able to show them off! Although neither are quite finished, both need pressing and the last embellishment putting on (are you intrigued or bored by this?!). Tonight is a D-day of sorts - it's time to get out the cotton angora and start making a shrug for myself. I am a bit nervous about making this even in the biggest size pattern as I am not a slim person and I'm a bit worried it won't fit. Still, it is the most gorgeous purple and if it doesn't fit me I'm sue someone else would like it (or it'll end up in K's dressing up box!). :) This one is cashmerino DK, so I think it would be fairly warm, actually - I'm probably about a month too late for UK weather (although apparently it's set to turn by the weekend so it may get some wear!). I'd like to try the same pattern with something of a more cotton-mix - I'm making a shrug from DB cotton angora and I think that would work up nicely to the same pattern, but be cooler. Don't know. I should have a couple of balls left at the end of the shrug as I bought a ten-pack, so I will give it a whirl when I'm done! I don't really know, tbh! I've never been much of a hat person (despite a really dodgy fashion phase in my 80's teens...! ), but having made a few of my own which are clearly too warm for summer, I'm really starting to wish for something lighter - I've even contemplated a straw hat! Admittedly this is because I am just that bit too tall to be completely shaded by the wall behind the bench in our back yard when the sun is high, so I get a hot head! K, on the other hand, thinks no day is complete without a hat and is currently sporting a very cute stripy cotton number. I'm not sure if she (or I, for that matter) would tolerate a beanie-style in this weather...but there is a rather nice cotton one in one of my books, I fancy making that. Tbh I made my first crochet hat because I'd been up to my in-laws in the NE where the winds howl down the beach from the Arctic...OMG, it was so painful without a hat! Never again, lol.